Seems these days that pizza joints are all over the place. There’s your local Domino’s, Pizza Hut and Papa John’s. And then there’s the mom and pop, hometown pizza joints that little leaguer’s gather at, and teenagers hang out at. Or there’s the go-to pizza joint that you pick up and order from to have delivered when you just don’t want to cook dinner at home its late at night and you just want to eat something but don’t want to go out. 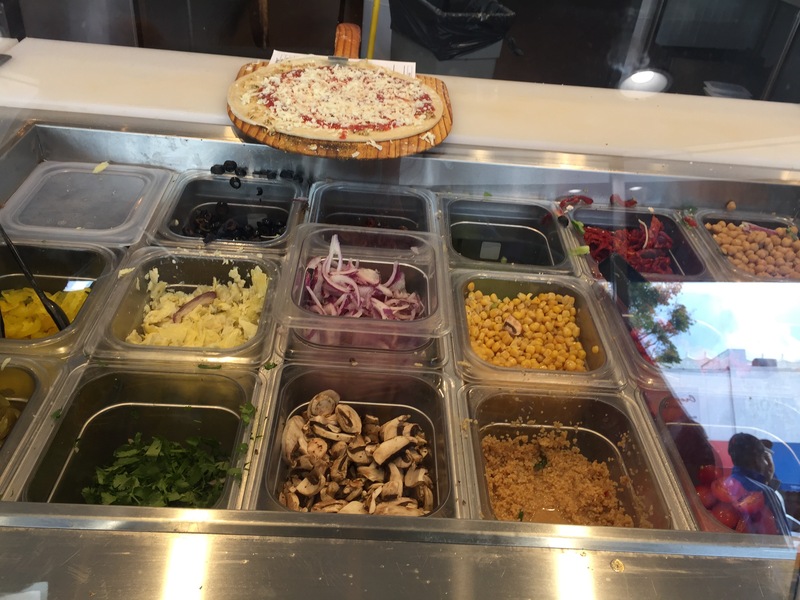 And now, these days, there’s the new kind of pizza joint that’s essentially like the Chipotle of pizza, you go in and order a pizza and they make it in front of you assembly-line style adding the toppings and ingredients that you want so that you end up with your own customized pizza in minutes. There’s a particular pizza joint like this that I had heard about and mentioned to my husband for months that I wanted to try. Unfortunately, its location just wasn’t in a part of town that we found ourselves in very often, and the thought of driving out that way just to try this new pizza place didn’t pique my husband’s interests. Fast forward a couple of years, the same pizza joint opened up a location just a few miles from where we live in LA. We put it on our list of places we needed to check out. 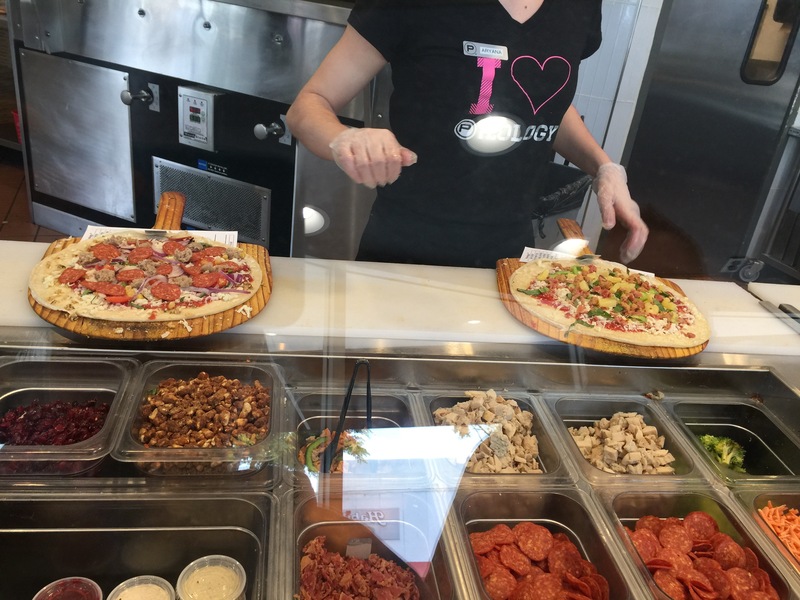 At Pieology Pizzeria their motto is “The Study of Custom Pizza.” Customized pizzas and salads your way with your ingredients the way you want it is what you get at Pieology, and all in just a matter of minutes too. 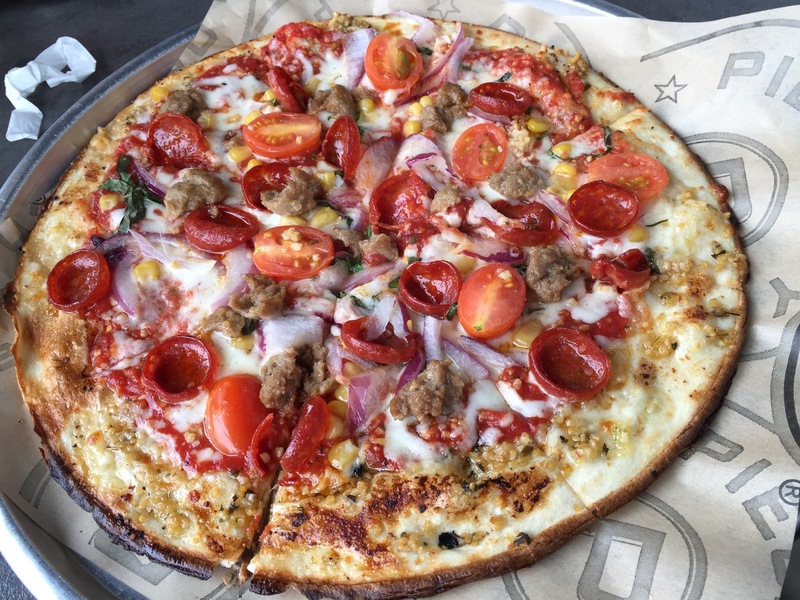 The idea behind Pieology came from the company’s founder, wife and children who wanted to come up with a way in which they could all spend more time together as a family. From that philosophy the idea of a make-your-own pizza place was born with the belief that you could bring people together over pizza so that they could spend time together and share memories with one another. And with all of the different options for pizza crust, and toppings and sauces, the combinations are limitless, as is the chance to share a meal with a friend or a loved one and to creating lasting memories over something as simple as pizza. 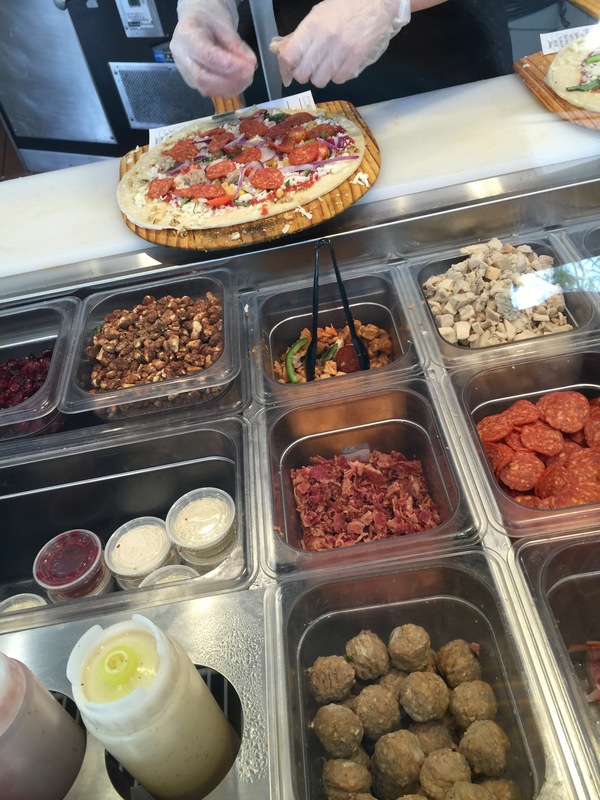 As mentioned, at Pieology you can make your own pizza your own way. However, if you find the choices a little too daunting and you just can’t make up your mind, there are some Pieologist’s Favorite Pies with pre-selected ingredients and sauces that you can choose from so you don’t have to come up with your own creation. But, if you want to make your own pie, you start by choosing your own crust. Due to the fact that this is a quick-cooking pizza, all of the pies are thin-crust and made in house on a daily basis. There are three different types of crust to choose from: house-made white, house-made whole wheat and gluten-free. Each pizza is served at approximately 11.5 inches, so it’s a pretty good size personal pizza. After the crust comes the sauce that tops the pie. 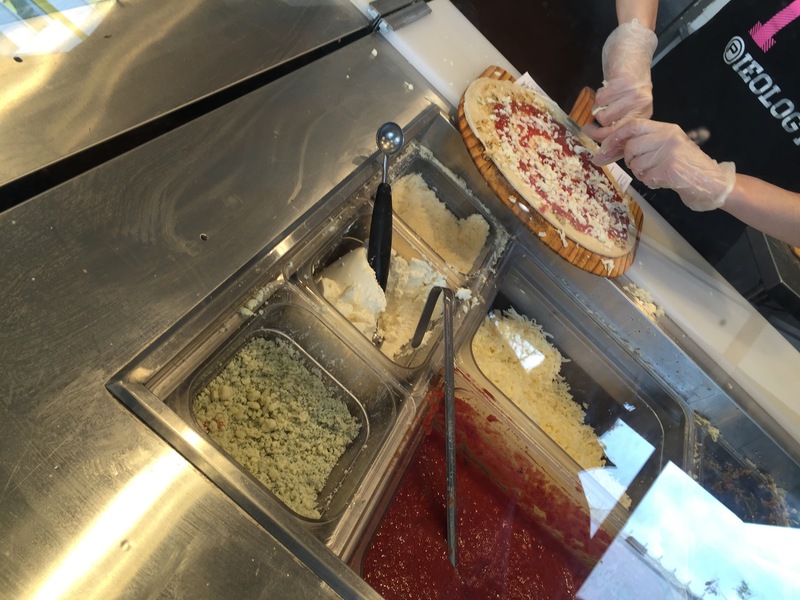 There are a large number of sauce choices, and the combinations are unlimited since all of the toppings, including sauces are unlimited. So, you could choose one sauce, or multiple sauces or make a pizza half of one sauce and half of a different sauce. The sauce choices include: house red, 3-cheese alfredo, herb butter, olive oil, fiery buffalo, pesto and bbq. For my husband and I, we each decided to make our own pizza. We both chose a house-made white pizza crust. I topped mine with a little bit of herb butter and then red sauce on top of that. My husband decided to go with olive oil topped with house red as well. Then comes the fun part of the pizza-making process, the toppings for the pizza. Let’s start with the cheese. What’s a pizza without cheese after all? At this point, the choices start to get a little dizzying because there are so many combinations you just can’t decide what to put on the pizza. Your cheese choices include: mozzarella, ricotta, parmesan, feta, Daiya mozzarella, and gorgonzola. Think about the different flavor combinations you could create from all of these different cheese options. I opted to go with mozzarella and a little bit of parmesan on my pizza. My husband chose the same combination of cheeses on his pie, mozzarella with a little bit of parmesan. Time for the protein now. Of course, you could also make a vegetarian pizza as well and skip all of the different meat options. But of course, I’m a meat eater, so I was definitely going to put some sort of protein on my pizza. I don’t think my husband would skip the opportunity to put meat on his pizza either. Your meat options are: pepperoni, sausage, meatball, Canadian bacon, all-natural bacon, all-natural chicken, and spicy all-natural chicken. 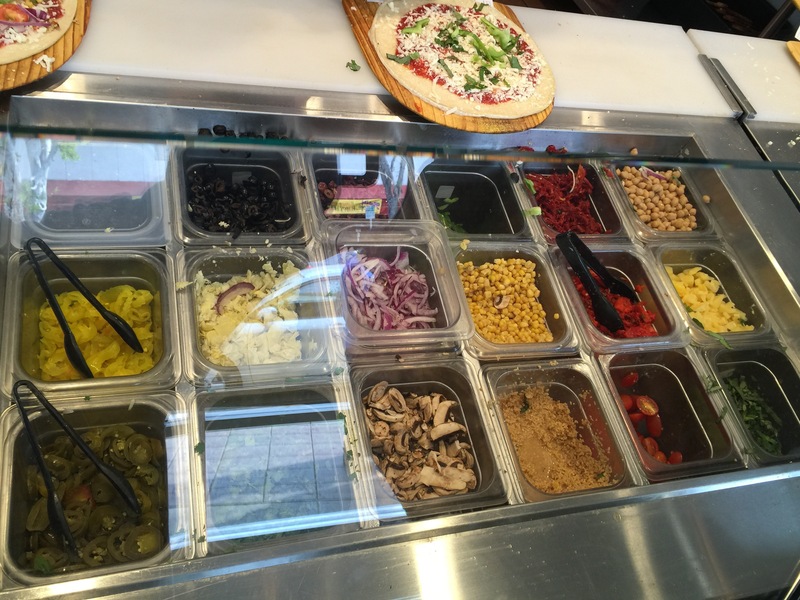 Again, all of the toppings are unlimited, so you can choose as many different types of meats for your pie as you want. I went with pepperoni and a little bit of sausage on my pizza. My husband chose sausage and bacon on his pizza. Last step in the process are the final ingredients that you may want to choose to put on top of the sauce and the cheese and the meats. You’ve got your veggie options. And these options are numerous: black olives, mushrooms, red onions, green peppers, artichokes, garlic, pineapple, jalapeño, corn, kalamata olives, fresh cilantro, spinach, banana peppers, fresh basil, grape tomatoes, and roasted red peppers. It’s no wonder you could come here and never get the same pizza twice. It was hard for me to try to decide what to put on my pizza, what toppings would go well with the sauce, cheese and meat choices I made. I ultimately went with red onions, corn, grape tomatoes, fresh basil and garlic. My husband went much simpler than I with fresh basil, pineapple and green peppers. Again, your choices are unlimited, there’s not a maximum or minimum of toppings you can order. Now the pizzas are done and ready to be put into the pizza oven. 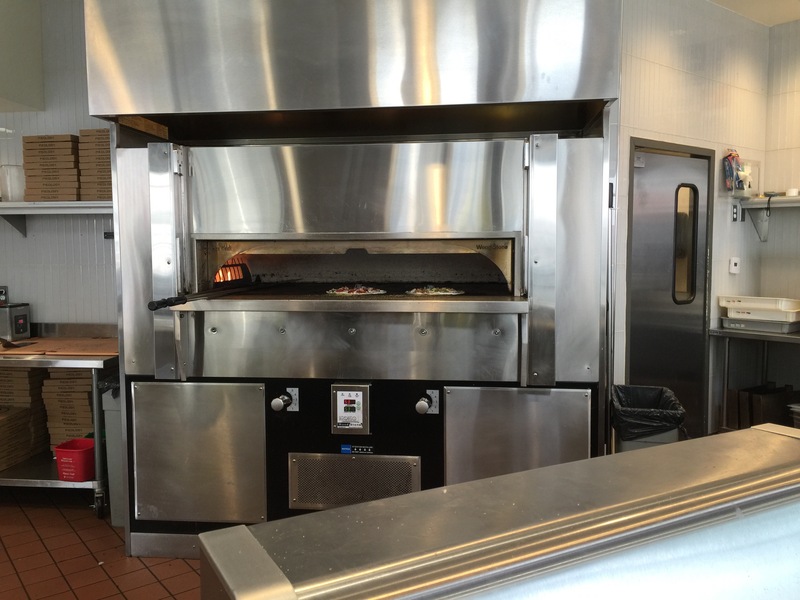 Because this is thin-crust pizza, it only takes about 8 minutes for them to cook your pizza all the way through. By the time you pay, get your drink and find yourself a seat, your pizza is pretty much read to come out of the oven, be sliced up and then delivered straight to your table. If you choose, after the pizza comes out of the oven, you can opt to have after bake sauces drizzled over your pizza. These sauces include pesto, bbq sauce, house red sauce and fiery buffalo sauce. This just adds an extra layer of flavor to your pizza. A few minutes after we sat down, our pizzas were brought to our table. Nice and piping hot straight out of the pizza oven, the pizzas were perfectly baked to a nice crispy golden brown. The toppings on the pizza were cooked enough that they weren’t raw, but they still had a bit of crunch to them. So the red onion and the green peppers still had a bit of crunch and bite to them. The pizza crust wasn’t weighed down by all of the toppings and somehow was still crunchy and crispy throughout. Both my husband and I thought that the pizza crust was the best part of the pizza. I thought that the herb butter sauce that I had put onto my pizza before the house red sauce was a bit too much and the herbs were really strong. I liked my husband’s use of olive oil better than the herb butter sauce. I also though that the garlic I had added as a topping was probably a little too much as well, and I love garlic. But in this case, I probably could have done without so much garlic. But overall, the pizza was well cooked, delicious and quite filling. An 11.5 inch pizza is quite a lot for one person to finish on their own. 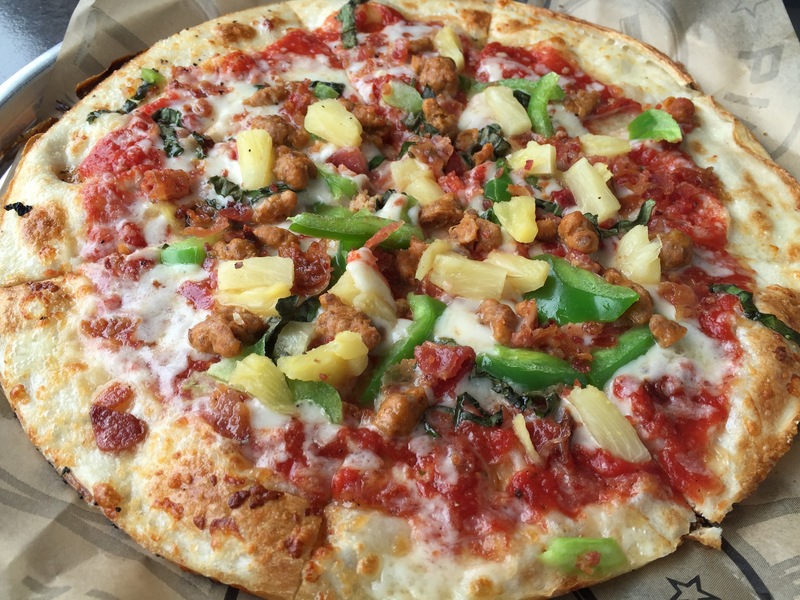 I liked the fact that Pieology’s customized pizza was truly unlimited. All you pay for is the pizza, what you choose to put on your pizza, how much or how little, is all up to you. It’s truly the skies the limit. The result is a pizza that is customized to your tastes. After baking for a scant 8 minutes in a pizza oven, you get a beautiful, perfectly cooked thin-crust pizza. 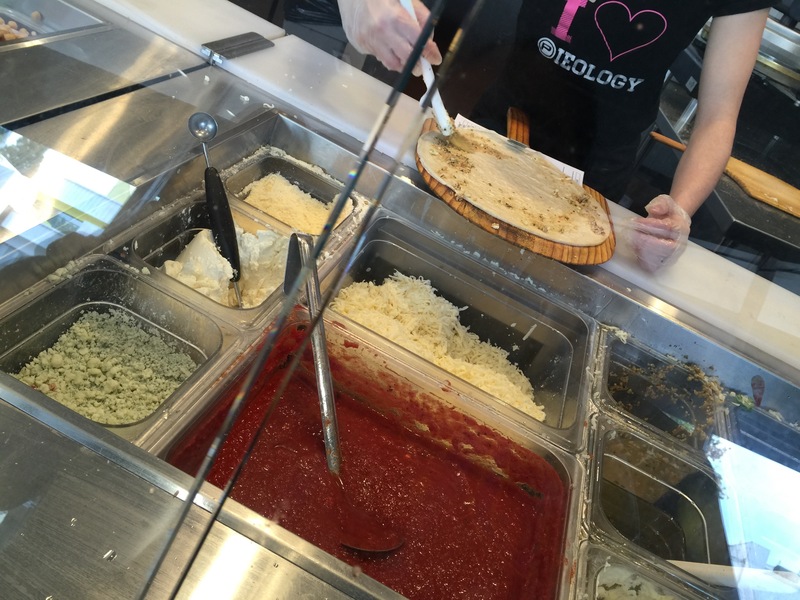 Pieology was fun, creative and delicious for essentially something that can almost be considered fast-food pizza. It’s something different and fun and there’s good food to boot. You can’t really go wrong.